Boston will soon be home to a number of luxury high-rises, among which will be the 58-story luxury condo tower that will sit in the Back Bay next to the Christian Science Plaza. A $700 million project, the Christian Science tower was approved by Boston City Hall recently and will be a part of the Four Seasons brand. Consisting of 180 ultra-luxury condos in the top 40 floors, construction is slated to begin in 2015 and plans for the opening are set for 2017. Downtown Crossing’s new Millennium Tower, which is currently under construction, will have 56 stores. Additionally, a newly proposed harbor-side tower complex will potentially rise 55 stores high and have 120 multimillion-dollar Boston condo units. These high-rises will feature top of the line, luxury condos priced at $4,000 or even $5,000 per square foot. Compared to Boston’s current luxury condos, they will be priced at nearly double. Some speculate the future of Boston may hold even higher condo prices nearly double what these new luxury buildings should fetch—some believe penthouses could sell for $25 million or more in the not-so-distant future. Other industry professionals have suggested waiting to see how these new luxury buildings fare before speculating how prices will progress. 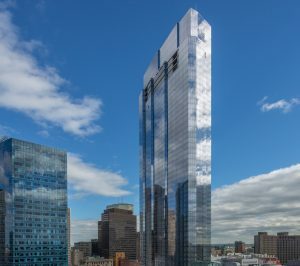 Regardless, it’s safe to say these new luxury high-rises will blow the ceiling off the current Boston condo market in terms of luxury and price. Currently, the tallest condo towers in Boston stretch no further than approximately 40 stores. 58 stories is a substantial stretch larger. Are you interested in purchasing or renting in any of these new Boston high-rises? Contact a real estate firm based in Boston that specializes in the high-end real estate market 617-356-7332. Are Strategic Defaulters Simply Deadbeats? previous post: Are Strategic Defaulters Simply Deadbeats?